Best of Australia – The Great Canadian Travel Co. 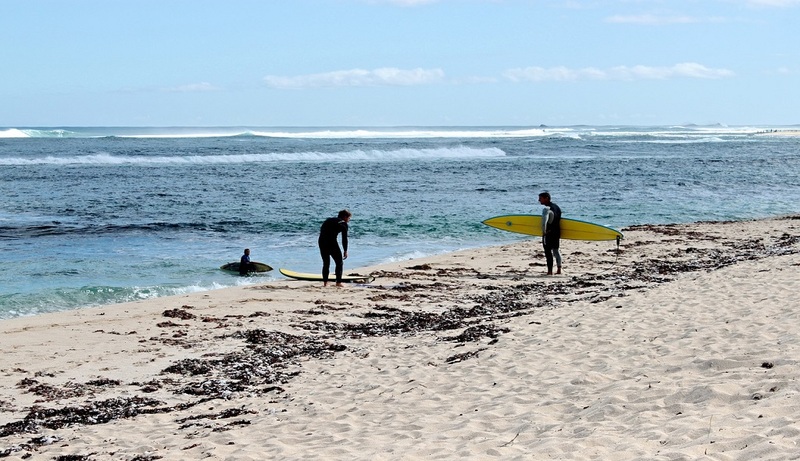 Hop aboard this 14-day trip down Australia’s East Coast and make the most of your time. Offering a solid mix of must-do experiences and uncommon adventures, you’ll learn to surf at Byron Bay, sail the Whitsundays and trek through Mossman Gorge in the Daintree Rainforest. Prices are shown in CA$, per person based on two people sharing a twin room. If you’re travelling solo you will be matched up with a traveller of the same gender in a shared room. If you prefer to have your own private room throughout your trip a single supplement, starting at CA$2,239, will apply. Please inquire for a single quote on the date of your choice. Arrive at any time. There are no activities planned until the evening welcome meeting at 7:00 pm for about an hour. The adventure begins tonight. Feel free to explore before your welcome meeting, but make sure you’re back in time to meet the group. After introductions, your CEO will review the details of your tour. Please note that normal check-in times apply at our start hotels, but you can usually store your luggage for the day if you arrive early. Head north to Cape Tribulation. 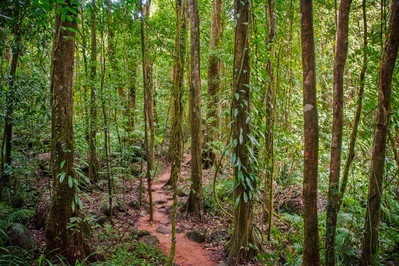 Stop en route to explore Mossman Gorge and take an interpretive walk through the Daintree Rainforest. 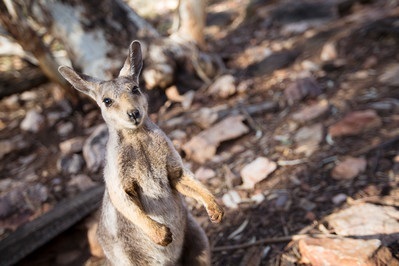 Follow the Aboriginal guide and learn about bush food, medicinal plants and the lasting relationship of the Kuku Yalanji people with their natural environment. Find out how to make bush soap, watch an ochre painting demonstration and sample some bush tea. 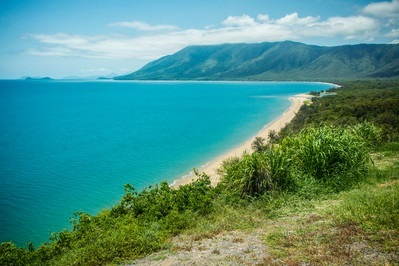 Depart early for a full day of travel to reach Airlie Beach with time to explore the town. Stop en route for lunch and a tour of the Ingan Cultural Centre. Participate in a painting activity with traditional Jirrbal Aboriginal artists – an excellent opportunity to see the diversity of an Aboriginal people from a local perspective! Enjoy a day sailing amidst some of the 74 tropical islands that make up the Whitsunday archipelago. Visit Whitehaven Beach, jump overboard for a quick refreshing dip, and make friends with the tropical fish that thrive within Australia’s Great Barrier Reef. 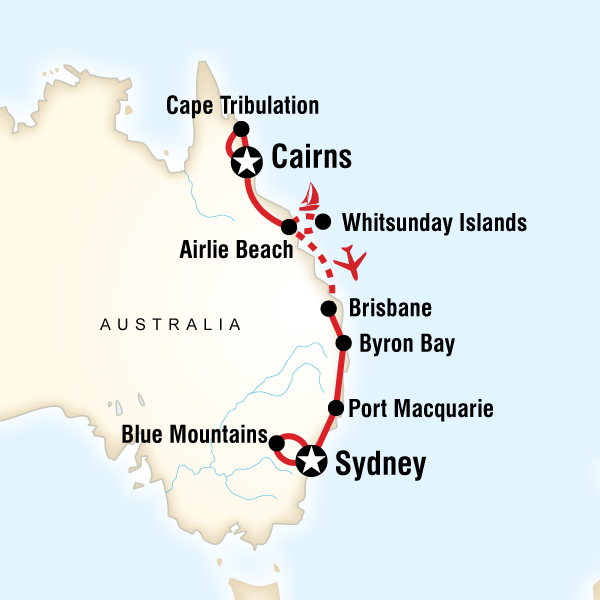 The Whitsunday Islands are in the heart of the Great Barrier Reef. Spend the day sailing, then when it gets too hot, pull on a mask and snorkel and dive overboard to check out the variety of brightly coloured marine plants, coral and fish that thrive right in these warm tropical waters. Optional Activities – Whitsunday Islands Snorkelling, 30 minutes to 1 hour, free of charge. Opt to visit a koala hospital before continuing on to Sydney for a night in the bustling city. Visit the Koala Hospital, learn about these unique creatures and even adopt your very own Koala! Enjoy a jet boat ride in Sydney Harbour before travelling to the Blue Mountains region. Want an adrenaline rush? A jet boat is the way to go. Hold on and get ready for a white-water thrill while gorgeous scenery whizzes past. 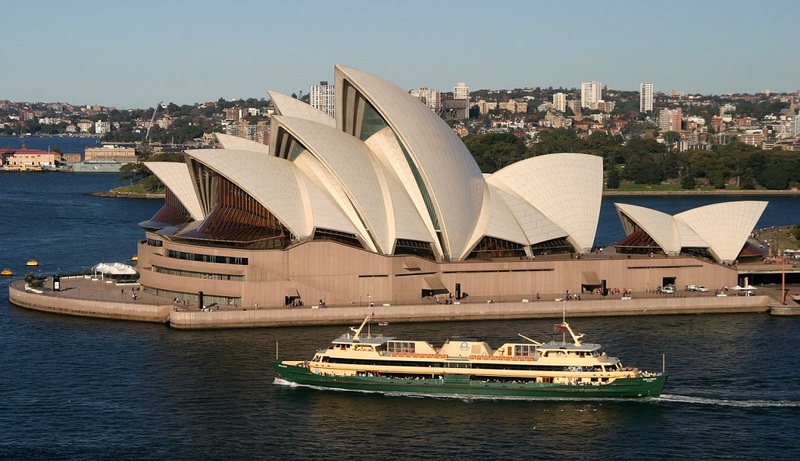 Explore Sydney Harbour, jetting by the Opera House, Harbour Islands and more! Explore the area around Leura and Katoomba including the Three Sisters. Visit the Jenolan Caves, take a walk in Jamison Valley, and opt for a ride on the Scenic Railway, the steepest railway in the world. In the case of bad weather or poor visibility, the Jamison Valley walk may take place on Day 13. With charming Leura as your base, explore the major attractions of the Blue Mountains from sightseeing to bushwalking to cafés and more. Jenolan Caves are a protected feature of the UNESCO World Heritage-listed Blue Mountains. These limestone karst caves are the world’s oldest caves and are significant both a scientific and sightseeing perspective. Enjoy a guided tour in the cool climes of this fascinating underworld. Take in some amazing lookouts over the Jamison Valley, via the iconic Three Sisters. Descend down the 900 step giant staircase to the valley floor. Walk amongst the beautiful forest to the steepest incline railway in the world — The Katoomba Scenic Railway. Opt to ride its 52-degrees angle or take the Scenic Cableway. If you’re keen for more walking, and time permitting, take the 900 stairs back up. This railway is steep and plunges into the rainforest and through the valley. The ride is scenically stunning. At the end, opt to take a rainforest walk or a cable car back to the visitor’s centre. Travel back to Sydney for a final evening in the big city. Get out and explore this fabulous and energetic city. Visit The Rocks area for some great options of restaurants and pubs. Depart at any time today or extend your stay for a few more days of exploration. 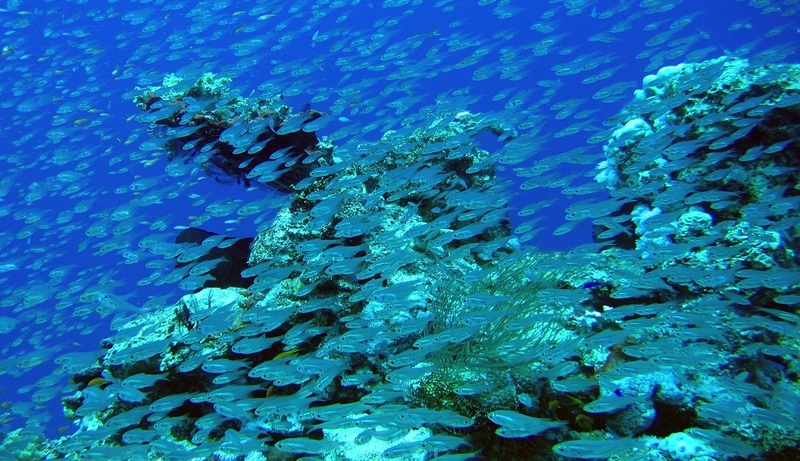 You haven’t truly visited Australia until you’ve experienced the Great Barrier Reef. Climb aboard a 25m (82 ft) catamaran and take the journey out to the largest coral reef system in the world, spending time snorkelling in search of colourful fish, majestic coral, and Nemo (of course). 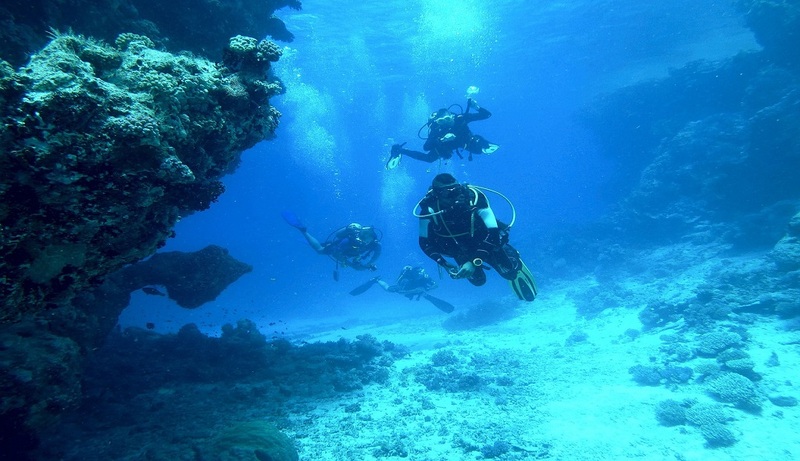 With the option to upgrade to go diving locally, get up close and personal with this natural wonder of the world. Soar above the Daintree Rainforest, learning about the impressive flora and fauna of the world’s oldest surviving rainforest. This isn’t your typical zip lining tour: Slowly glide between platforms to take in the impressive views of the rainforest and Great Barrier Reef. Led by extremely knowledgable guides, learn more about this stunning part of the world from the top of the canopy. Please note that passengers must weigh less than 120kg (265 lbs) to participate. Climb to the summit of the Sydney Harbour Bridge, 134m above sea level, while an expert guide tells you stories about the history and construction of the bridge. The panoramic view of Australia’s central city will take your breath away. Soak in amazing panoramic city views of Sydney at the top!